We built the most secure and solid integration possible using the brand new OAuth based integration system Microsoft has recently released. Some other sites on the internet require you to store your Active Directory credentials, and their software logs in as you on your behalf. We store a token that is only allowed access to the calendar, not the entire active directory domain that you might be an admin of. 4. When you delete an appointment in Office365/Google, we will delete our app's copy. As you can see from numbers 1 and 3, this is a two-way sync. For Office365, there is a very small delay on the sync right now (up to an hour), and that will move to real time very soon. The Google Calendar sync works in the same way, and there is no delay. As stated previously, Office365 should be on real-time syncing very soon. Head to the user menu (your email in the upper right) and click "Calendars." From here just follow the instructions! 1. 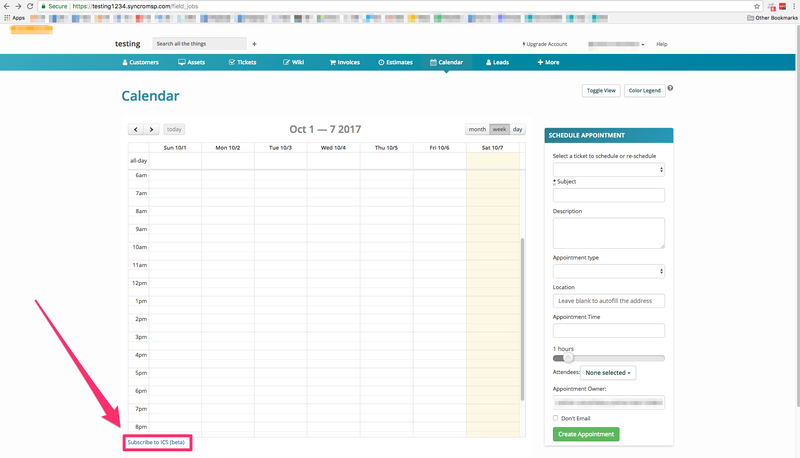 Go to your Gmail account, and login with the correct account (Google account associated with https://*****.syncro.com/google_calendars). 2. Make sure you are on the calendar, and not email. If you aren't, click the Google Apps Icon in the upper right-hand part of the screen, and click Calendar. 3. In the top right-hand part of the screen, look for the Cog wheel. Click the drop down arrow attached to it, and click settings. "If you select No, you won't see an event on your calendar unless you've responded "yes" to it. If you've shared your calendar with others, they'll still be able to see all the events even if you haven't responded yet." The easy way that gives you the most power is probably to buy a program to keep a Google Calendar synced with your Outlook calendar. This way you get the benefit of the two-way syncing, as you update google calendar, it should update your Outlook calendar. Another way we just added, and we are offering it out for you to use - as-is and without support - is subscribing to an ICS calendar in Outlook. Here I'll show you how to do it in a modern Outlook 2013 that is already connected to a few Exchange calendars. First, head to your field jobs page and copy the link. All set! Your entries for 60 days prior and 60 days in the future will show up on the calendar. *Note - this ICS link only updates every 30 minutes, so if you are testing this - be aware of that.